At a time when many musicians struggle to find an authentic representation of self in their music, the charismatic Luke Blu Guthrie is a beacon of originality. 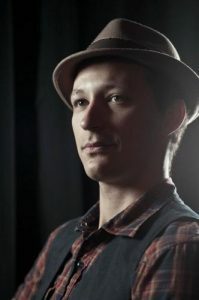 Deeply soulful, and passionately committed to creating and sharing his music, Luke Blu has devoted much of his life to his craft. Often armed with only an acoustic guitar, Guthrie has been an integral part of the Vancouver Island music scene for two decades. He is widely respected for his versatility and skill as songwriter, vocalist and guitar player. Born of humble beginnings in a rural setting, much of Guthrie’s music is reflective of his childhood experiences living a simple lifestyle while surrounded by a colourful and eclectic cast of characters. These experiences, combined with an unquenchable thirst to understand the mechanics and soul of music, have helped to shape and guide his personal and musical journey. The result is a body of contemplative, original music that bends and blurs the boundaries between multiple genres. Guthrie’s music is a clever and potent fusion of folk, funk, dark country and rock n roll. It is representative of a lifetime of thoughtful listening and his uncanny ability to select elements from each genre then combine them to create a refreshingly innovative, yet timeless style that engages the sensitivity and sentiment of a broad range of listeners. Luke Blu’s lyrical wanderings show a profound and raw understanding of the human condition. Whether he is exploring the dark underbelly of human nature, taking a light hearted look at the frivolity of flirtation, or contemplating the joy, mystery, and confusion of love and loss, Guthrie’s stories are poetic and poignant. With a firm belief in the importance of human connection, he successfully manages to provide a compelling, cathartic experience for his listeners, giving them an opportunity for greater insight into themselves, providing comfort, escape, and a chance for greater empathy. A naturally charismatic and dynamic performer, Guthrie will be charming audiences for years with his electrifying playing and smooth vocals. 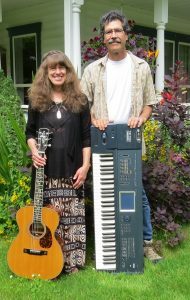 Steve and Vivian Ruskin are a multi-genre duo (or trio) with a large set list that keeps all generations thoroughly entertained. Steve plays keyboards (that can produce the sounds of many instruments) and he also plays harmonica and adds sweet harmonies to Viv’s strong and versatile vocals. Viv adds guitar to the instrumental mix and if they are performing as a trio, violin, cincello and horns are added. Playing at the market is one of their favorite gigs~! 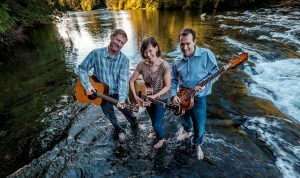 Today's musician: Maple Creek Maple Creek hits all the right notes with their acoustic, harmonic renderings of popular and lesser known tunes. Maple Creek hits all the right notes with their acoustic, harmonic renderings of popular and lesser known tunes.